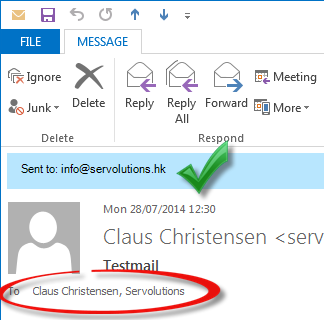 Available now for Outlook users, AddressView solves a problem that those who use multiple email addresses from the same Exchange mailbox will have encountered time and time again: Outlook displaying only your name as the recipient and not the full email address to which the person sent it. Even when viewing the email in more detail, all that is shown is the ActiveDirectory entry, not the exact email address. With the AddressView plugin, you can instantly see which of your addresses the person was sending the email to so you can be secure in the knowledge that you have the right background. This add-on is compatible with all versions of Microsoft Outlook and is available for a 30-day free trial. After the trial period, there is a one-time cost of €25 with a discount available for bulk purchases of more than five licenses. Servolutions has over 12 years of experience in the field of email server add-ons. With a focus on extreme reliability, ease of use, and features that users really need, Servolutions takes pride in providing timely and friendly support. As a Microsoft Small Business Specialist, all Servolutions’ software is tested to be 100% compatible with all Microsoft SBS products.